The Boone Central volleyball team showed improvement and got that elusive first win of a tough season in action this past week. The Cardinals traveled to Twin River for triangular play Oct. 11. After dropping a 20-25, 14-25 decision to the host Titans, ranked in the Class C1 Top 10, Boone Central bounced back to defeat Fullerton 22-25, 25-19, 25-13. Boone Central’s JV also split matches, losing 13-25, 23-25 to Twin River and defeating Fullerton 25-21, 24-26, 25-15. “The varsity and JV both had great nights, with the varsity getting its first win and being very competitive against state-ranked Twin River,” praised Coach Susan Roberts. “We had our best serve-receive of the season, with 91 and 94 percent. A majority of those passes were in system so we could run our offense. Boone Central (1-18) returned home Thursday, hosting Hartington Cedar Catholic on Senior/Parents Night. The Card varsity gave the Trojans a fight before bowing 8-25, 19-25, 25-23, 14-25. 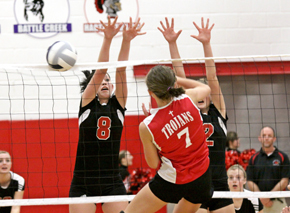 The Boone Central JV dropped a 20-25, 19-25 decision and the 9th/10th grade team was defeated 25-22, 19-25, 13-15. Roberts again felt her varsity squad showed progress, needs to play with more consistency to be effective.